The names of the Anishinaabe are many; [sic] Ojibwe, Chipewyan, Ojibwa, Chippewa, but [sic] united by a shared history of clans, language and culture, all identify the thousands of politically autonomous bands and tribes which make the Chippewa Nation the largest tribe in North America. Most significant of among these shared backgrounds are the spiritual practices and values of the Grand Medicine Society, which continue today. Situaged along the shores of the legendary waters of Lake Superior, the Red Cliff Reservation is located on the Bayfield Peninsula. These lands and waters are renowned for their pristine environment, rugged waters, wilderness areas and unique scenic beauty. And [sic] here, the people of the big water or "Gi-Chi-B-Waa-Tig" remain today, at the hub or center of a [sic] historical, spiritual and cultural crossroads. The Anishinaabe were told by a prophet that a sacred shell would guide them on a long journey to the "food that grows on the water." That food today is known as "Maa-No-Min" or wild rice. The journey led to an island called "Moo-Ning-Wana-Kawn-Ing," which means "the place of the yellow-breasted woodpecker." Centuries later this island was renamed Madeline Island. 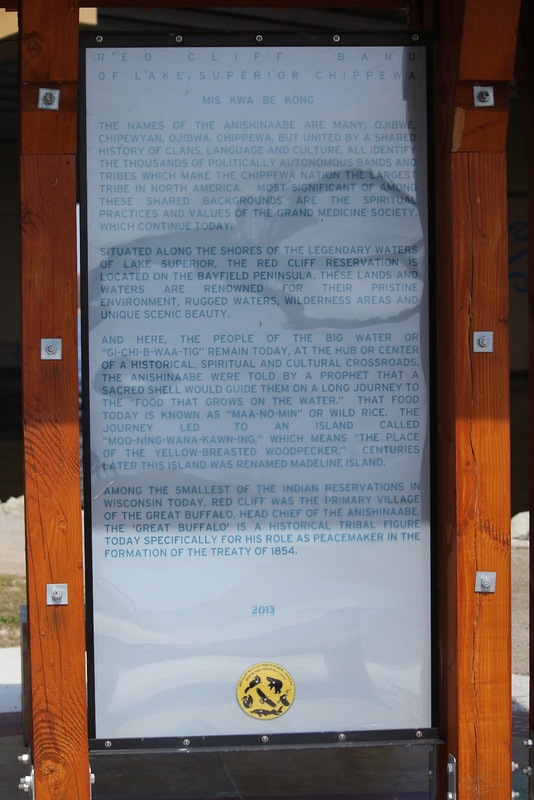 Among the smallest of the Indian reservations in Wisconsin today, Red Cliff was the primary village of the Great Buffalo, head chief of the Anishinaabe. The "Great Buffalo" is a historical tribal figure today specifically for his role as a peacemaker in the formation of the Treaty of 1854. Great Buffalo and several band chiefs were delegated to begin the long journey to Washington D.C. to meet with President Millard Fillmore. The chiefs carried the words of the Grand Councils and a "Pa-Wa-Gon," or Great Pipe. Following the meeting, the chiefs returned home with that pipe, now known as the "Buffalo Peace Pipe," which became a symbol of our Nation's agreement and today is preserved and protected by the Red Cliff Tribe. The Treaty of 1854 would forever change the Anishinaabe as well as other tribes and with the establishment of homeland reservations, marked the end of federal efforts to remove tribes onto lands west of the Mississippi River. As the largest employer in Bayfield County, the Red Cliff Tribe is a significant partner for the economic prosperity of the region in sustainable economic and community development. The tribe operates a full range of governmental, cultural and recreational opportunities, providing services and facilities for health clinics and senior centers, tribal fisheries and aquaculture research, police, fire, conservation and emergency services. A lakeside resort hotel, conference center, casino and marina facility provide a gateway to the islands and waters of the island Archipelago. 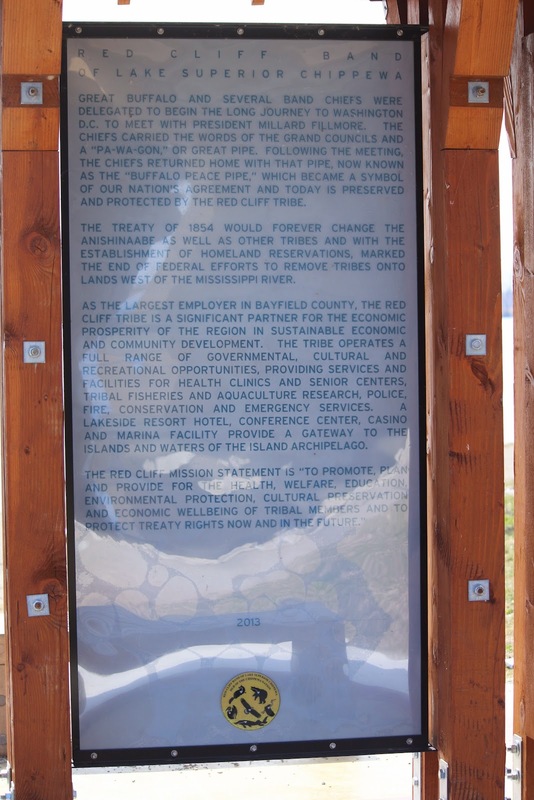 The Red Cliff Mission Statement is "To promote, plan and provide for the health, welfare, education, environmental protection, cultural preservation and economic wellbeing of tribal members and to protect treaty rights now and in the future. The entrance (I used) to the Tribal Heritage Crossing of the Wiouwash State Trail is located adjacent to the parking lot for Two Brothers Family Restaurant, located at 1930 Rath Lane, Oshkosh, Wisconsin 54904. NOTE: The parking lot adjacent to the restaurant is posted as "for customers only". However, there is plenty of parking on Rath Lane. Be sure to check the Google Map coordinates before heading out. NOTE: The trial loop is about four miles in length. This location is Overlook 6 (see map below) in a series of historical marker kiosks that comprise the Tribal Heritage Crossing of the Wiouwash State Trail. Click here for more information about the Tribal Heritage Crossing project and links to photos / transcriptions of all markers on the Trail. This is a two-sided marker . . .
visible at the top of the hill. View from Overlook 5: Lac du Flambeau Bank of Lake Superior Chippewa. The path to the Red Cliff Band of Lake Superior Chippewa kiosk (above and below). This media file prepared by US I 41 Project is in the public domain.